This is a story about finding and returning to one's roots. Marco De Santis' family has been making wine in Italy for generations and his great grandfather traveled from a small village in Central Italy to Tacoma, Washington in 1904 to work on the railroad. Marco then returned to his ROOTS in Washington State 111 years later to dedicate part of his life to crafting ultra-premium wines that showcase the Red Mountain terroir. The most unique aspect of the winery is that each blend is composed of grape varieties that share genetic ROOTS. Our two flagship wines, Laevus and Dexter (Latin for left and right), are single vineyard blends that represent the pinnacle of our wine program. Laevus is a co-fermented blend of Petite Sirah with its parent Grape, Syrah, from Red Heaven Vineyard. Dexter is a co-fermented blend of Cabernet Sauvignon with its parent grape, Cabernet Franc, from Scooteney Flats Vineyard. co-fermenting these parent and offspring grapes results in expressive, rich and harmonious wines. We hope you gather with family and friends over a bottle of our wine to discuss your own ROOTS! Brooding aromas of blackberry preserves laced with brown sugar and baking spices, with hints of new leather, violets, game and wet stone. A generous forepalate of dark brambly fruit with exotic spice and a dense mouthfeel lead to refined but big, chewy tannins and a very long finish. Bursting aromas of dark cherry, baking spice, tobacco leaf and dried herbs. A mélange of concentrated cherry, raspberry and red currant fruit flavors glide along the palate with balancing acidity and very fine tannins. The long iron tinged finish screams Red Mountain. Marco De Santis was born in Toledo, Ohio and lived most of his life there until he went off to medical school in Bradenton, Florida. Marco's family has made wine in the Abruzzo region of Italy for generations but he developed a deep passion for winemaking during his medical training in Michigan, where he completed a residency in Internal Medicine and a fellowship in Endocrinology. He learned the fundamentals of winemaking by reading classic textbooks and applying his knowledge on a small scale at home. When he moved to Washington he teamed up with veteran winemaker Josh Maloney in order to utilize his expertise in crafting unique, terroir driven wines from the Red Mountain AVA. Marco met his wife Andrea, an organ transplant coordinator, at his 10 year high school reunion. They got married in September 2013 and moved to Washington State in November 2015. In February 2017 they welcomed the arrival of their son Lorenzo. They enjoy cooking, hiking, traveling and spending quality time with friends and family. Joshua Maloney began making wine professionally in the New York Finger Lakes over twenty years ago. After working with cool climate varieties such as Riesling and Gewurztraminer for two years, he relocated to California, working first for Stag's Leap Wine Cellars in Napa Valley, then Estancia in Monterey County. In 2005 he was hired by Chateau Ste. Michelle to be their Red Winemaker, running their Canoe Ridge Estate facility. After six years in this role, he left Ste. 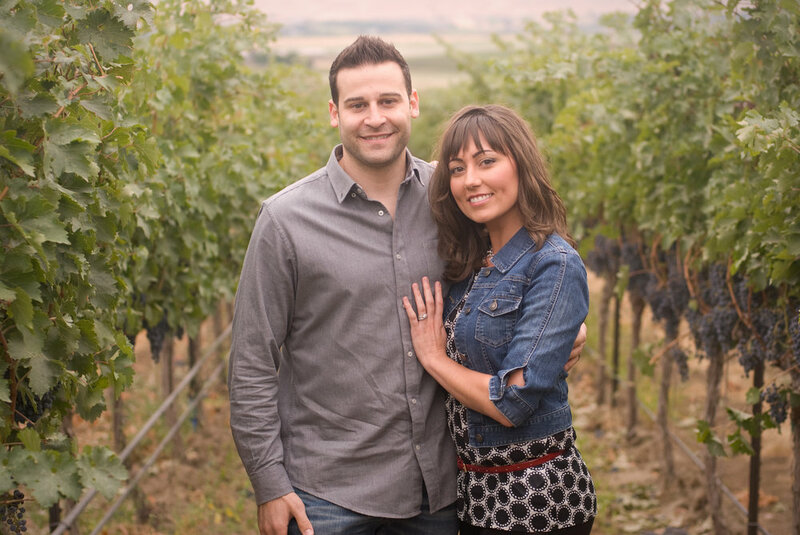 Michelle to work as the Head Winemaker for Milbrandt Vineyards as well as Director of Winemaking for Wahluke Wine Company, a custom crush winery. It was during this time that he started his own brand, Maloney, that focuses on terroir driven, single vineyard Cabernet Sauvignon. In 2016 he left this position to focus on his own brand and his consulting role as our winemaker for Radix. Joshua's specialty and focus as a winemaker is applying his vast repertoire of winemaking techniques to accentuate the terroir of each parcel of grapes to create wines that reflect the vineyard, variety and vintage. During his career he has earned more than 70 scores of 90 or higher from the major wine publications, has worked with fruit from nearly every AVA in Washington, and has created blends as small as 71 cases to as large as 300,000. Aside from wine Joshua is very passionate about cooking, music and his continuing effort to finally reunite North and South Dakota. Make sure you get the latest information on all our products and wine tastings. Just fill out the form below.